This is the official first-light for my new QHY 163m cooled CMOS camera. 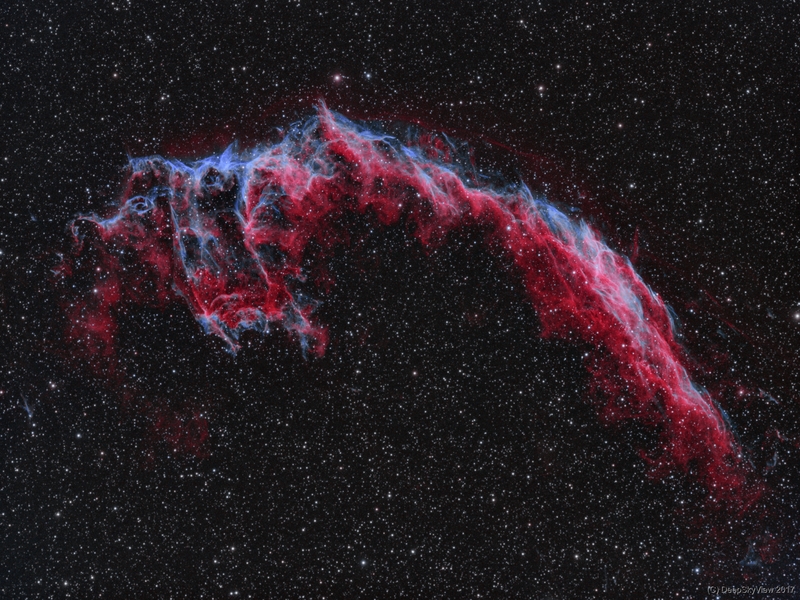 For this, I decided to go for the Eastern Veil Nebula, again. The Veil is definitely one of the most striking supernova remnants. The supernova that created it has exploded 8000 years ago and the remnant has been expanding since then. The entire nebula is 110 light-years across, covering six full moons on the sky as seen from Earth, and resides about 2100 light-years away in the constellation Cygnus. This is a bi-color narrowband composite using a total of 9 hours of data captured from my backyard in the Frankfurt area. The combination of APM 107/700 Triplet APO with field flattener plus QHY 163m gives an ideal scale of around 1.1 arcsec/pixel and a sizable field at the same time. After the first camera had some hardware problems, this is my second QHY 163m which works very well. Processing this image was straight forward, noise and sharpness were fine from the beginning. Have a look at the image in full-screen mode! I am very happy with this first light… more to come!